This article explains this new feature with simple and extensive list of examples. Shared Hosting/Multi-tenant scenario where common database used by multiple tenants to store the data. In such cases we want each tenant is restricted to access their data only. In a traditional database, where we want to control the access to rows based on user’s role. 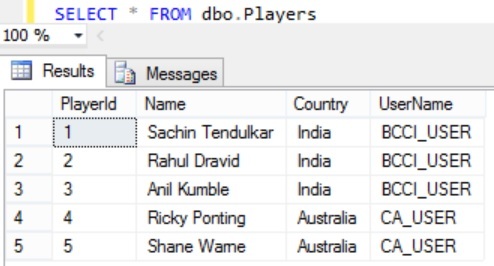 EXAMPLE: Let us take a scenario where we have a Cricket related database with Players table as shown in the below image. Assume that the players table has all the cricket playing countries team’s player data. When individual country cricket board application/user access this table data we want to return only the players belonging to that country. Let us create a Predicate function which returns 1 when user has access to the row by the following script. For this example we will use simple logic to determine the access to the row. The logic in this case is, if the name of the user who is executing the query matches with the UserName column value of that row or the name of the user who is executing the query is ICC_USER the user is allowed to access the row. Now execute the below statement to see whether I am (i.e. dbo owner) still able to fetch all the records from the Players table, which I was able to do prior to creating the security policy. 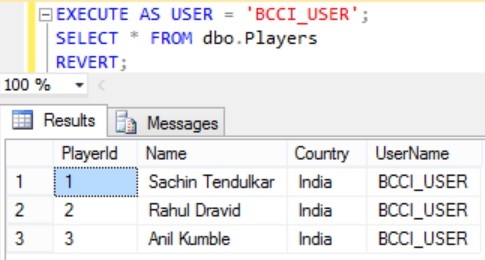 From the result we can see that BCCI_USER with which the above query is executed can see only Indian cricket players as only these players UserName column value matches with the BCCI_USER. 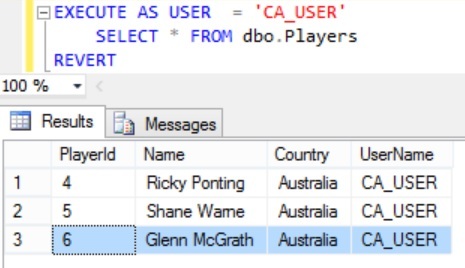 From the result we can see that CA_USER with which the above query is executed can see only Australian cricket players as only these players UserName column value matches with the CA_USER. 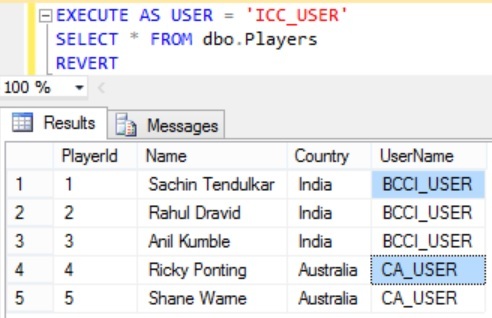 As per the filter predicate function definition the ICC_USER should be able to see all the Players rows. Let us confirm this by executing the following query. 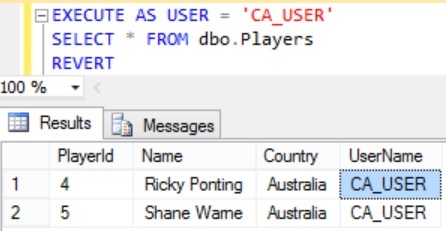 From the result we can see that the CA_USER has access to the Australian Player record which BCCI_USER has inserted. So from the above example we can see that a FILTER predicate is not blocking the user from INSERTING a record which after insert is filtered by it for that user for any operation. Let’s add the AFTER INSERT BLOCK predicate on the Players table to block user from inserting a record which after insert user doesn’t have access to it. 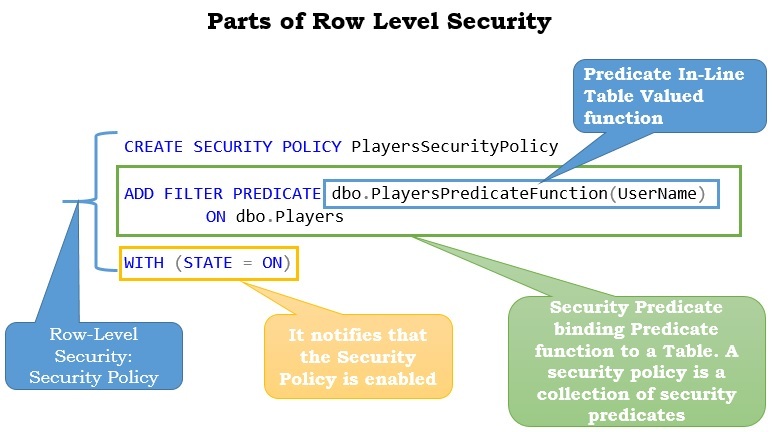 Execute the below statement to alter the above Security policy to add the AFTER INSERT BLOCK predicate. Here for the AFTER INSERT BLOCK PREDICATE we are using the same predicate function which we have used to filter the records by the FILTER PREDICATE. Basically, the AFTER INSERT BLOCK Predicate blocks user from inserting a record which after insert doesn’t satisfy predicate function. In other words from this example perspective the AFTER INSERT BLOCK predicate blocks the user from inserting a record which after insert user doesn’t have access to it. The attempted operation failed because the target object ‘CRICKET.dbo.Players’ has a block predicate that conflicts with this operation. If the operation is performed on a view, the block predicate might be enforced on the underlying table. 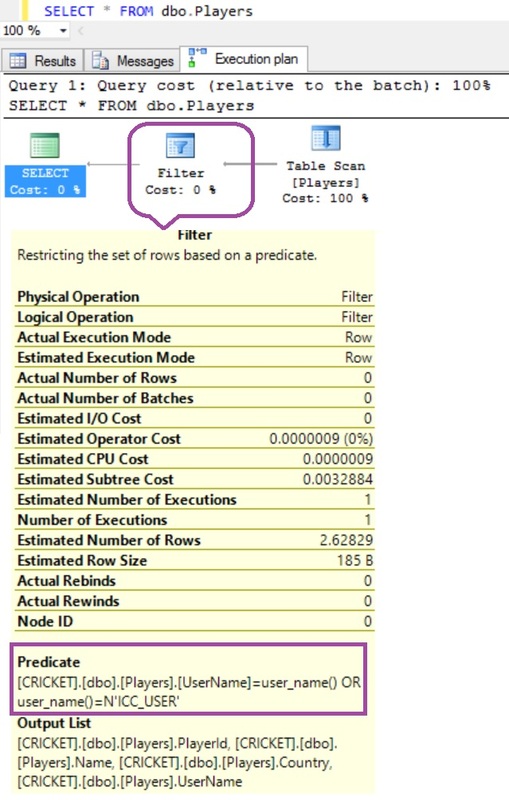 Modify the operation to target only the rows that are allowed by the block predicate. 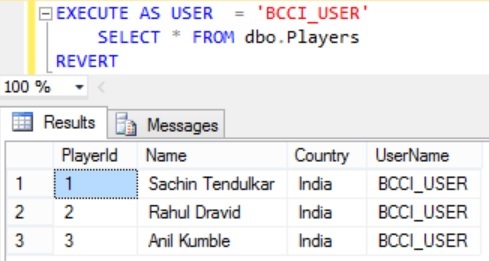 From the result we can see that BLOCK Predicate is blocking a BCCI_USER user from inserting a record which after insert user doesn’t have access to it.